The Codes of Practice are vital, but alone are not enough – a mechanism is needed to demonstrate that Codes are being followed in order to build confidence throughout the value chain. The Animal Care Assessment Framework provides a credible process to follow when developing an animal care assessment program. Animal care assessment programs will change over time. 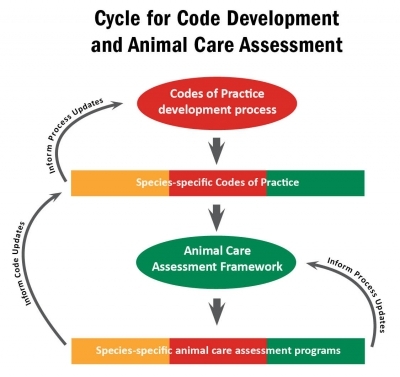 Click <here> for NFACC’s process for maintaining recognition by NFACC of an animal care assessment program that has undergone changes. The framework should also ensure that animal care assessment programs provide benefits to both farmers and the animals under their care.